Taking pictures underwater can be a good experience if you pick the right camera. Your not taking pictures in the sky. Your taking them in H2O and millions of ocean bacteria. An ordinary camera equipped with water proof case might not be enough. Consider getting the best camera for diving tech. A highly detailed waterproof camera lens equipped. A durable high water pressure feature. Maybe even have a protective deep water case to protect it against sea rocks and fall. Consider all these things when trying to take pictures in underwater environments. It looks really cool to see all the sea life and plants move in harmony. But, it must be done right. More information below. SLR lens have been proven by many scuba divers as being the best lens to have for underwater shots. Len adjustments can be made on the spot, and the lens are capable of catching every particle in zoomed in detail. In addition, SLR lens have very low shutter lag. The pressure your camera is going to experiencing can make the shot flash wrong. The shot needs to coordinate with the water in real time and in best rotation. The lens move like a spiral. They need to be in perfect balance to have the shot looking clear. Any disruption in the lens can cause the lens to stutter and have shot looking very unprofessional. Hook up SLR lens to your camera or but a camera that has SLR lens built in. The best camera for diving should have SLR lens installed. Double check to make sure the manufacturer or company has created SLR lens. Water proof cases are designed for underwater pictures, but you need to make sure it really works. There are hundreds of them on web. See if you bought the one that work well on a camera. Test it out in a pool on on a beach. Test it out for days. Do not assume it works after one day. You might want to take more underwater pictures in the future. The water proof case you buy must work. Also, see if you can put it on properly. If it is hard to put on, then you use another water proof case for your underwater camera. The color in oceans have a blue light to images, so get a camera that has manual white balance in it. Adjust the white balance to make the blue fade out and see colors in the sea. Real colors in the sea. Not the colors that have this blue or green tint to it. Change the white balance to suit the color to fit your own personal sea taking pictures style. Modern technology is not perfect in making a program to fix the blue underwater. But, it comes pretty close in giving you an artificial color balance to see the color in a way it would look if it is not underwater. You might like the new balanced color. Try it out and see. If you don’t like it, then go with a camera without white balance. With two of the patriarch’s granddaughters on the team, the Kelowna Kaos won the women’s portion of the fourth annual Andre Blanleil Sr. Memorial Fastball Tournament on the weekend at King Stadium. Courtney Blanleil hit a single and scored twice, while her cousin, Taylor Blanleil, added a hit and one run as the Kaos completed a sweep of their three games over two days by outscoring the Kelowna U18s 6-5 on Sunday Kkwin the first womens’s championship game. The Kaos, who downed the U18s and Vernon Tanks for the right to play in the final, took a 4-0 lead after three innings and went ahead 6-2 in the fifth. But the U18s wouldn’t go away, scoring two runs of their own in the bottom of the third, two in the fifth and another in the sixth to make it close.Twyla Whaler proved the biggest producer in the final, going 3-for-4 and driving in three runs for the Kaos in an event honouring the man who played, coached and/or managed fastball teams — both men’s and women’s — in six decades in Kelowna before he died of cancer in 2011 at age 74. On the men’s side, Surrey prevented a Blanleil-family sweep by defeating host Andre’s 4-0 in the men’s championship game on Sunday. Surrey scored the only run it would need in the fourth inning on a single and a run-scoring double. They put the game away with three runs in the seventh. 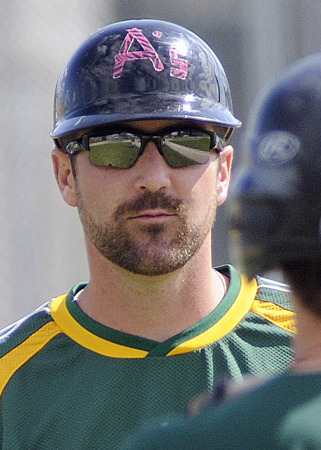 Andre’s, going into the final with wins over the Kelowna Brewers (3-1) and the Kelowna Rangers (1-0), threatened in the bottom of the seventh of the title matchup. They loaded the bases, but couldn’t cash in. Five Blanleils were a part of the Andre’s team. Andre Sr.’s sons, Andre and Rene, were the first baseman and catcher respectively, while the youngest son, Maurice, was a coach. Grandsons Travis and Kyle played centre field and left field respectively. Andre Sr.’s wife of 53 years, Eileen, was a familiar voice from her familiar perch at the foot of the stands. Three members of the 2015 Okanagan Athletics have secured baseball scholarships to colleges in the United States. After Matt Brodt’s performance on the weekend in Langley, he could very well be following in his teammates south of the border. Matt Brodt held the Langley Blaze hitless over seven innings for his first career no-hitter on Saturday in Langley. The Penticton native held a potent Langley Blaze lineup hitless for a complete seven-inning 2-1 B.C. Premier (Midget) Baseball League victory. The 17-year-old also connected for two hits himself in the team’s only win in four starts on the weekend. Brodt said he wasn’t thinking about the no-no until the bottom of the seventh inning. What Brodt was doing was throwing his fastball in the right location and keep the Blaze off balance with a curveball — a combination that produced his first-ever no-hitter of his baseball career. “I can’t even remember coming close to a no-hitter before,” said Brodt, who issued three walks in the ballgame. “I wasn’t doing anything different than in the other games, but the guys behind me were playing steady and things just fell into place,” noted Brodt, who couldn’t recall any notable plays that saved the no-hitter. 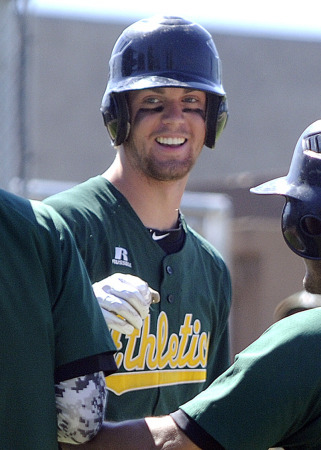 In his second season with the A’s, Brodt plans to return to the Kelowna-based team for the 2016 season. He said he hasn’t been scouting out possible scholarship opportunities, but will definitely start looking around for a college or university next season. West Kelowna’s Trevor Lofstrom has signed a letter of intent to play baseball at El Paso Community College beginning this fall. The A’s managed just five hits themselves in their only win. The deciding one came off the bat of Trevor Lofstrom, who earlier in the day signed a letter of intent to play with El Paso Community College in Texas next season. With Brodt on with a single, Lofstrom put the sweet part of the bat on a rising inside fastball from Cooper Misic and powered it over the leftfield fence for his second home run and 19th run-batted-in of the season. Langley’s only run came in the bottom of the fifth inning with the help of two Okanagan errors. 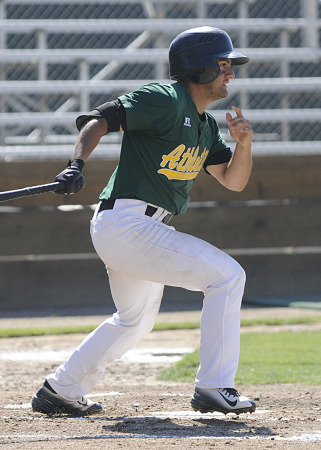 There was a downhill trend after the opener, as the A’s fell 8-3 in the second game on Saturday and dropped 7-1 and 5-3 decisions on Sunday, earning the third-place Blaze a 22-10 record — four games up on the sixth-place Athletics (18-14). While the A’s could muster a total of only 13 hits and seven runs in the final three games, Brodt for one doesn’t believe his team is outmatched by the Blaze. “This a good team we have — we’ve been hurt badly by injuries and we were missing guys because of graduation on the weekend, so we know we can hold our own against a team like Langley. They’re definitely beatable,” said the Grade 12 student at Pen-Hi. Lofstrom echoed his teammate’s sentiments. Leading the team with a .375 average, Trevor Mlait will be counted on to provide similar offence for the Eastern University Eagles next season. The El Paso Tejanos also believe they have a winner in Lofstrom, who received a full-ride scholarship and will report to camp in mid-August. An athletic 6-foot-4, 205 pounds, Lofstrom has all the physical tools to develop into a legitimate NCAA Div. 1 ballplayer, although his 2015 stats in BCPBL could bely the fact without close scrutiny. He’s hitting a so-so .272 and leads the team in strikeouts with 28, but he’s second on the team in RBI with 19 (Sam Avila leads with 27) and he’s tied with Chase Decosse for extra-base hits with nine, including his two homers and pair of triples. Coach Evan Bailey says he’s “honoured” to be able to send a “high-level player and quality individual” to his alma mater in El Paso. He believes Lofstrom has earned every single penny of his significant scholarship. Catcher Chase Decosse will join Okanagan A’s teammate Trevor Mlait at Eastern Utah University after signing a letter of intent recently. Meanwhile Trevor Mlait, a schoolmate of Lofstrom’s at Mt. 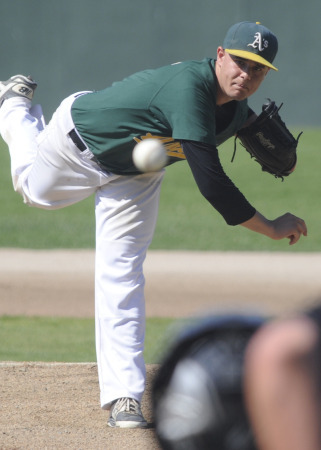 Boucherie, has signed on with the Eastern Utah University Eagles baseball team in Price, Utah for the 2015-16 season. Mlait, a 5-foot-8, 175-pound outfielder, leads the Athletics with a .375 average, although he’s missed almost half the season due to injury. Bailey believes Mlait would be a great fit for any college program. “He’s a hard-nosed kid with an aggressive mindset,” said Bailey. “Trevor truly demonstrates an all-around package with his athletic ability, academics, work ethic and desire to get better every day. Mlait’s teammate, Decosse, will join Mlait at Eastern Utah. The Penticton minor baseball product, is an A student at Kelowna Secondary School this season and he’s matched that kind of rating on the field with the baseball A’s. Okanagan A’s head coach, Evan Bailey, has high praise for three of his seniors who have earned baseball scholarships to community colleges in the United States. Leading the team in doubles with eight, Decosse is fourth in RBI with 15 and sports a .287 average. 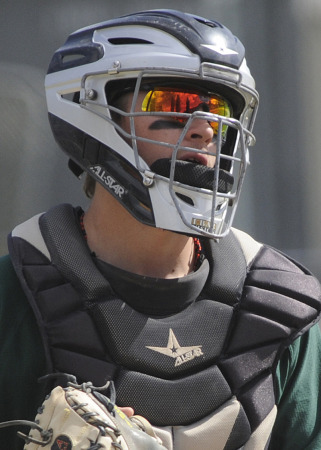 Just as important to coach Bailey and his future coaches in Utah, is that there appears to be a huge upside to the 5-foot-9 catcher. Meanwhile, the A’s are off this weekend, and won’t be back in action until the 12th annual Baseball Blast, hosted by the Kelowna Jays June 25-28. The Athletics will be among 12 college, senior and semi-pro teams in the tournament competing for $10,000 in prize money. The Kelowna Cubs had their chances, but couldn’t score a run for a second straight game against the West Kelowna D-Backs in B.C. Midget AAA Baseball League play on Wednesday. 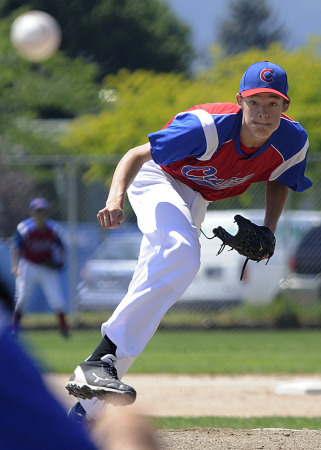 Gavin Barrett of the Kelowna Cubs allowed only three hits, but he and his team dropped a 2-0 decision to the West Kelowna D-Backs on Wednesday at Lombardy Park. Outhitting the D-Backs (8-4), the Cubs left nine runners on base and ended up dropping a 2-0 decision to the visiting West Kelowna team at Lombardy Park. West Kelowna, improving to 19-12 on the season, scored the only runs they’d need in the second inning to record their third consecutive regular-season win over the newly formed across-the-bridge rivals. Ty Loeppky led off the second with a walk and Nick Ostromfollowed with a single, while the two of them advanced a base on a passed ball. Cam Rasmussenscored Loeppky with a groundout to shortstop, while Ostrom crossed on a Jacob Hollandgroundout to first base. Starting pitcher, Carter Martenssurvived the eight-hit Kelowna attack over the first five innings to secure the win on the mound. He struck out five Cubs batters and issued one walk. Jamie Pavia mopped up with two hitless innings that saw him strike out four. Meanwhile, Gavin Barrett came through with a stellar performance for the Cubs (9-19), limiting the D-Backs to just three hits over the seven innings. He had one strikeout and walked two. Along with teammate Taylor deGruchy, Barrett also contributed two hits. The D-Backs were coming off a weekend in which they dropped a pair of games (8-7 and 8-2) to first-place Ridge Meadows (22-3) and split a pair (lost 2-1 and won 3-1) with host Tri City Indians. In their only win, West Kelowna overcame a 1-0 first-inning deficit with a run in the sixth inning and two in the seventh. Pavia led the D-Backs with a pair of hits, while Chase Gaudette went the distance off the rubber. He limited Tri City to five hits and struck out six in a complete-game seven-inning effort. The Cubs split their four games on the road on the weekend. They swept Tri City 2-1 and 4-0, while dropping 11-1 and 13-3 decisions to Ridge Meadows. deGruchy connected for two hits and drove in two runs to lead the Cubs in the 4-0 win over Tri City, while Brandon Ludwig picked up the win by holding the Indians to three hits over 5 2/3 innings, while striking out six. Dante Dennisheld the hosts hitless the rest of the way. In the 2-1 victory, the Cubs scored the deciding run in the top of the seventh inning to make a winner of Barrett, who went 5 2/3 innings and allowed just two runs and struck out seven. Dennis again came in relief, allowing one hit. The Cubs are back on the road this weekend when they travel to Chilliwack for a pair of games on Saturday. On Sunday, they’re in Aldergrove for a twinbill. Meanwhile, the D-Backs are at home on Saturday, playing host to the Vernon Canadians at noon and 3:30 p.m. at Boucherie Park. They travel to Vernon on Sunday for a return doubleheader. Kelowna’s Taya Hanson has an opportunity to take on the world. The Grade 9 Dr. Knox Middle School student was among 12 players officially announced today in Toronto as members of the Canadian U16 cadette basketball team that will compete next week at the FIBA Americas championship in Puebla, Mexico. A top-three finish there would qualify Canada for the world U17 championship tournament in 2016. Taya Hanson, a guard with the Kelowna Owls’ junior team last school season, will wear the Canadian uniform in Mexico next week. Hanson, who turned 15 on Sunday, was identified as a candidate for the team while playing for Team BC at the Basketball Canada national U15 championships last summer. She was invited to a national age-group assessment camp in Toronto in December. Twenty-four of the 30 players were invited back to the U16 trials in March, while 17 of those, including Hanson, received the invitation to try out at a two-week camp earlier this month for the 12 spots on the national team. 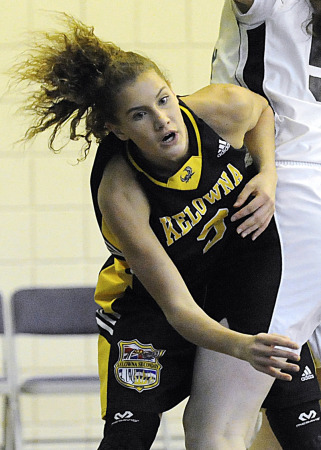 Co-head coach, Carly Clarke of Ryerson University in Toronto, said Hanson, a product of the Kelowna Minor Basketball Association, stood out most because of her fitness. Clarke added that Hanson, a guard who played with the Kelowna Secondary School junior team last school season, will be relied upon to be one of the key ballhandlers on the national team. 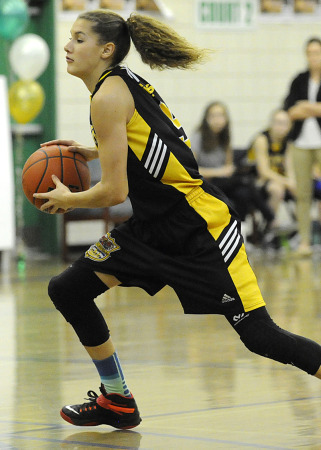 Her fitness and defence stood out as Taya Hanson earned one of 12 spots on the Basketball Canada U16 cadette team. Clarke added that a focus for Hanson will be on making good decisions under pressure. Clark said that while Hanson will likely not start most games, she and the rest of the team will get a good share of playing time. The U16 team will leave for Mexico on Saturday and will play exhibition games against the United States and Brazil before meeting Cuba (June 24), Venezuela (June 25) and Brazil (June 26) in the preliminary round. The semifinals are set for June 27 and the championship and bronze-medal games for June 28. “We are excited to observe these young girls’ growth during this competition and to see how what they’ve learned is integrated into their training after this experience of competing against the best of their age in our Americas zone,” said Denise Dignard, director of women’s high performance for Basketball Canada. Canada, ranked fourth in the world in FIBA women’s age-group rankings, qualified for the U17 world championship tournament in 2014 and finished sixth. The team won a bronze medal in 2012. Brody Anjo of Kelowna played the round of his life on Saturday and then survived a shaky Sunday to win the Zone 2 (Thompson-Okanagan) Junior Tour golf championship. Carding his first-ever sub-par round (71) on opening day of the 36-hole tournament at Gallagher’s Canyon Golf Club, Anjo overcame three tough holes on Sunday to shoot an 78 and edge the junior season’s order of merit champion, Matthew Kreutz (74-77) of Vernon, by two strokes. Anjo, in only his third season of competitive golf, surprised even himself on Day 1 when he walked off the 18th green and found out he had a three-stroke lead over Kreutz, a five-time winner on the Zone 2 Tour this season.His initial victory on the Junior Tour also earned the 17-year-old a berth on the four-man team representing Zone 2 at the B.C. junior men’s golf championship tournament in Osoyoos July 7-10. Other members of the team will be Kreutz, Austin Bosquet of Vernon and Brandon Whistle of West Kelowna. “I just figured if I could shoot 71, there must have been others — especially Matthew — who could do the same or better,” admitted Anjo, a Grade 12 Kelowna Secondary School student. Even par after nine holes in the opening round, Anjo got off to a rocky start on the back by taking a double bogey on No. 11, but back-to-back birdies on holes 12 and 13 put him back into his unfamiliar groove. A 20-foot “bomb” for bird on the 16th green put him one-under for the day. “It was a great round for me. I was hitting the ball really well all day, and I just got more relaxed and more confident as the round went on,” recalled Anjo, whose previous best round on the tour was a 77 on the Bear course at the Okanagan Golf Club earlier this season. Anjo said he continued to hit the ball well on Sunday but with not quite the same results. Touring the 6,434-yard layout in final foursome with Kreutz, Anjo lost the three strokes he had on the Vernon Golf and Country Club member after nine holes. The two were dead even going into the back nine at the GCGG. But a quadruple bogey by Kreutz on the 10th hole proved his downfall and buoyed Anjo’s outlook. Kreutz got back to within three strokes on the 12th, but a double bogey by Kreutz on the 14th gave Anjo what he was confident would to be an insurmountable lead. “At that point I figured he (Kreutz) would have to play catch-up, while I could just play it safe and go for the pars,” said Anjo, who did give back three strokes to Kreutz on the final four holes, but was able to withstand the charge. Encouraged by his round on Saturday, Anjo said he’ll definitely be back to play on the Zone 2 tour next year. Meanwhile Whistle, returning from the Bonnyville Pontiacs’ camp in Edmonton recently (he’ll play for the Alberta Junior Hockey League team next season), finished third in the two-day Zone 2 championship. He shot a pair of 77s to finish five strokes back of Anjo and third overall in the 2015 order of merit with 213.75 points. Kreutz finished with 407.50 and Bosquet, who placed fourth among the 56 golfers on the weekend with rounds of 79 and 76, was second overall for the season with 254 points. A newcomer to the Okanagan from New Zealand, Wilkins will lead the Zone 2 juvenile team that will also include Cameron Welchof Kelowna, Wyatt Brook of Kamloops and Braeden Cooperof Vernon. That provincial tournament will be played at the Spallumcheen Golf and Country Club in Vernon Aug. 18-20.George Wilkins of Lake Country carded a 76 on Saturday and came in with an 82 on Sunday to finish in fifth place overall and first among the juvenile aged (15-16) golfers. In the Zone 2 girls’ tournament, also played at Gallagher’s, Emma Sabbaghof Kelowna shot rounds of 82 and 76 to finish sixth overall on the co-ed leaderboard and edged out Kelowna’s Mckenna Lesiuk (77-82) for top spot. Lauren Rutherglen (80-81) of Kelowna and Adams State University, along with Haley Hewer of Penticton (82-79) were another two strokes back at 161. Sabbagh and Lesiuk will represent zone at the B.C. junior girls championship tournament being played at Cordova Bay Golf Course in Victoria July 7-10. The Kelowna Falcons halted a six-game losing streak and managed a split of their West Coast (Baseball) League doubleheader with a 6-2 win over the Walla Walla Sweets on Wednesday. The Falcons lost the first game of the twinbill 6-4 and sit at 4-7 going into Thursday’s third game of the series in Walla Walla. A combined one-hit performance by three pitchers got the Falcons back in the win column in the second game. As in the first game, the Sweets got on the board first, courtesy of a rash of bases-on-balls. Falcons’ starter, Matthew Moriarty lasted just 1 1/3 innings. He didn’t allow a hit, but did give up two runs on five walks. Brett Solano came out of the pen and was brilliant, throwing 4 2/3 shutout innings. He gave up but one Sweets hit, while striking out six on the way to the win. Matt Rigby cleaned up in the seventh, striking out one on route to a save. Offensively the Falcons tied the game in the top of third with a pair of runs. Scotland Church smacked a one out single to score both Kevin Biro and Josh Croft. In the top of the sixth the Falcons scored three runs, all in very different ways. Thomas Lanecollected his first run-batted-in of the summer with a single to score Church. The next batter, Colton Waltner, hit a sacrifice fly to score Nick Minteer. Then Brandon Grimsley scored on a wild pitch. The Falcons scored an insurance run in the seventh when Grimsley knocked in Jeff Nelsonwith an RBI single. In all, the Kelowna offence outhit the Sweets 11-1, led by Jared Smith and his three-hit night. Grimsley, Minteer and Church each had a pair of hits. In game one, the Sweets took advantage of a wild Kevin Flemer, who was making his Falcons debut. The Oregon State starter lasted just one inning, walking four and allowing five runs. Joel Lamont pitched the second inning and allowed a run on two hits. Finally, Aaron Mason took control throwing the final four innings, giving up just three hits, but the damage had already been done. With the Falcons trailing 6-0 in the fourth inning, the offence finally showed some life, getting a RBI sac fly from Smith to score Church. The Falcons had three hits in the inning. Then in the sixth, the Falcons scored a pair of runs as Minteer crossed on a Waltner fielder’s choice before Grimsley scored on an error. In the seventh Grimsley brought in Nelson on an RBI single, but that’s as close as the Falcons would come. Flemer was tagged with the loss despite the Falcons outhitting the Sweets 10-6. Church, Nelson, Minteer and Grimsley each had a two-hit game. op performances by Okanagan Gymnastics Centre helped Team BC claim second place overall at the Western Canada Cup tumbling and trampoline championships in Calgary. Jaylin Otteson and Abby McDonald teamed up to take the bronze medal in the Provincial 3 synchronized trampoline event, while Otteson won the Provincial 3 individual tramp title. McDonald earned top spot in the Provincial 4 championship on the double mini trampoline; finished third on the individual tramp; and added a third place in the Provincial 2 tumbling event for third place all around. As part of Team BC, Otteson and Mcdonald contributed to B.C.’s third place in trampoline, double mini and tumbling. The grand total is calculated by taking the top three scores of the four team members in each event finals. B.C. took second place all around. Two other OGC athletes, also coached by Jamie Gardner, chose to travel to the competition as independent competitors. Jordan Macdonald finished sixth in the Provincial 3 individual trampoline and fourth in the Provincial 2 double mini competition. Andrew Oliver of the OGC also competed, placing fourth in the Provincial 4 trampoline and ninth in the Provincial 4 double mini. While the host teams weren’t among the medalists at the seventh annual B.C. flag football championships, the Kelowna Minor Football Association is expected to be the big winner later this fall. A record 116 teams and about 1,200 players competed in 505 games during a 29-hour period at the Mission Sport Fields recently. And Jeff Koltun, president of the KMFA, sees those numbers making an impact on the upcoming tackle football season. The KMFA flag season this spring included 300 players, with 27 of the 32 Kelowna teams taking part at the provincials where each team played a minimum of 10 games. “We played 25-minute games in pool play and that allowed teams to play more games and gain more experience,” said Koltun. Koltun said the growth in the sport is due in part to being inclusive, affordable and accessible. The under-10 provincial championship was won by the North Surrey Thunderbirds, while the North Delta Longhorns (Black) won the U-12 title. The Royal City Hyacks (Orange) finished first in the U-14 division and the North Delta Broncos took the U-16 championship. The first-ever provincial U-19 title went to the North Surrey Ravens. The top finish among KMFA teams was turned in by the U-10 Kelowna Vipers, who placed eighth among 20 teams. A contingent of 53 Kelowna Ogopogo Swim Club athletes combined for a 250-point margin of victory in the team competiton at a summer meet in Merritt on the weekend. While the Ogopogos reigned as the winning team, numerous individual swimmers stood out, among them Sydney Reynolds, Erik Haaheim and Myles Woodward, all of whom swam 100 per cent best times. Flyn Huber of the Ogopogos took the aggregate silver in the Div. 2 boys’ competition, while Logan Lalonde broke the 30-second mark in the 50-metre freestyle event on the way to securing the aggregate silver medal in Division 5.The Division 4 girls led the way to the podium, with Makenna Haight and Rachel Schueler tying for the aggregate gold. Yet another silver aggregate went to Emalie Schueler in the Div. 6 girls competition. Bronze aggregate winners among the Ogopogos were Kylie Haight – Division 2 girls; Randi Thompson – Division 6 girls; Patrick Epman – Division 7 boys and Andrew Skilbeck – Division 6 boys, who is in his first season with the team. The Ogopogos continue their summer schedule this weekend with a meet in Lumby. The bad weather held off and the stars came out on Thursday at Parkinson Sports Fields. About 70 players showcased their talents in the annual Central Okanagan Rugby Enthusiasts high school all-star games. PRC selectors, UBC Okanagan coaches and Kelowna Crows coaches were on-hand to watch the top U-18 and U-16 players compete. A evenly matched game saw the Blues win with a late try.The afternoon began with the U-18 match under threatening storm clouds, featuring the top players from Kelowna Secondary School, Mt .Boucherie Secondary and Rutland Secondary playing against former teammates and with former opponents. The U-16 match featured the top players from Const. Neil Bruce Middle School, Glenrosa Middle, Kelowna Secondary, Mt. Boucherie Secondary, Rutland Middle, Rutland Secondary, and Springvalley Middle schools. The Blue jerseys appeared to have all the luck on the day, winning the U-16 match as well. Mt. Boucherie Bears — Travis Bello, Cole Bertram, Jakob Brown, James Gabriel, Quinn Dartnell, Eli Hogarth, Keegan Hughes, Ben Krell, Connor MacLeod, Tyler MacLeod, Rylon Meyers, Tyler Ostrom, Brock Zeleniski and Aidan Zimmer. Kelowna Owls — Tofer Dang, Dom Haynes, Andrew Henseleit, Robin Huculuk, Owen Marshall, Ross Mosychuk, Zach Neufeld, Brendan Struthers, Thomas Yang and Kurt Yesilcimen. Rutland Voodoos — Tristan Allen, Riley Dickson, Osiris Dion, Lucas Gering, Kyle Hillier, Stuart Marais Tuttle, Trenton Nesdoly, Johnny Roy, Matt Walz and Mitchel Walz. Rutland Voodoos — Connor Allardyce, Quinn Allardyce, Nick Ciupka, Jacob Dawson, Elias Gering, Kurtis Kilmartin, Mitchell Kilmartin and Seth Nemeth. Kelowna Owls — Keenan Berg, Seth Campbell, Nico Dirksen, Kyle Durec, Rory Haynes, Jack Lawson, Jake Lutz, Erik Mitchell, Cole Stregger, Noah Trites and John Yu. Constable Neil Bruce Cubs — Quinn Caldwell, Wyatt Fagan and Chris Smith. Rutland Middle Voodoos — Jordan Crawford and Tanner Friesen. Springvalley Stingers — Eric Ferguson and Josh Saunders. Glenrosa Jaguars — Storm Fisher, Max Krell and Eddy San Agustin. Immaculata Mustangs — Logan Kilpatrick, Peter King, Giovanni Sambrielaz and Brady Shaw. Mt. Boucherie Bears — Aiden McLeod, Valentine Paul, Mackenzie Symmon and Ty Truong.